early 20th century Chinese Mille Fleures Imperial type porcelains. The Golden Girl, The Extraordinary Tale of Gustav Klimt's Masterpiece, Portrait of Adele Bloch-Bauer by Anne-Marie O'Conner is a scholarly book by a journalist. From my painter's perspective and my Jewish grandfather's knowledge of the Silk Road influences to European art the esoteric symbolism was missed by O'Conner. The second Adele Bloch-Bauer portrait (1912) is a special piece of historic symbolism. 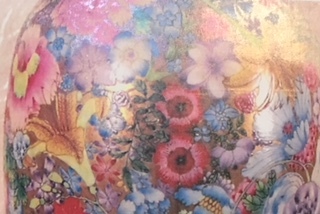 The background colors are the same as on Chinese porcelain Adele was known to collect. Some colors were developed in the Levant and Europe carried to Asia by Arab and Jewish traders. In the 19th Century improvement in color s was assisted by the Jesuits. The Chinese figures and flowers in the background are in the style of Chinese porcelain painters making the portrait painting symbolic of the back and forth exchange of technology and artistic inspiration between East and West. With China's current interest in the Silk Road perhaps the painting will become part of the tourist experience. Probably the gold leaf in both Adele portraits has special significance as on the porcelain vase. According to my grandfather the gold in the negative area is like the gold thread that connects life past, present and future. Gold leaf on the edge of pages in a book makes each page precious page symbolic of a day of life. Am I going too far to see Adel likened to a porcelain vessel? Her skin as luminously white as china? The rim of her hat - the abundantly flaring lip of a vase edged in white? White symbolizes mourning. The red is symbolic of virtue and truth. Black symbolizes bruising and evil according to the book, Outlines of Chinese Symbolism and Art Motives by C.A.S. Williams, first edition 1931. The stylization of her body - the body of the vase with arm and hands the handle? The tiny feet the base of the vase? Future posts will cover how other master artists have employed negative space. In 1912 when the painting of Adele was painted there was upheavel in China. One family of European descents native to East Asia for several generations for a time lived in Europe. To support themselves they sold Japanese wood block prins, Chinese Imperial porcelains, Imperial rank patches, and textiles to live. 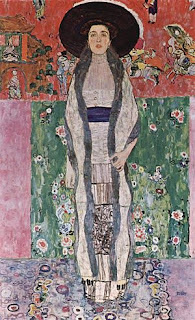 The Boch-Bauers and Klimt were a buying Asian art In Vienna the works of Confusious and Lao Tzu were available and read by Klimt. In the "Footprints of Buddha" the vase is one of auspicious signs symbolizing the idea of "not leaking". and signifying that condition of supreme intelligence triumphant over birth and death. ( p. 416 of "Outlines of Chinese Symbolism and Art Motives", by CAS Williams) Evil colors surround Adel. The green rectangle could be symbolic of the color of the painted board carried by a criminal going to be executed, on which the authority for his punishment is inscribed. Her teeth stained and one tooth darkened by injury, she is painted, never the less, as triumphant dressed in white silk and appearing to levitate. 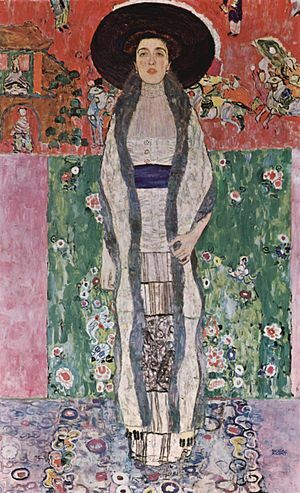 The symbolism of Klimt remains mysterious and invites speculation. Undeniable is the curious overlapping of East and West symbolism probably from the spread of ideas in trade along the Silk Road.